The childhood of real-life Romani Eldra Roberts was the basis for the S4C Film Drama Eldra, now available on DVD by ValleyStream. It's a sad fact that the real-life "Eldra" never lived to see the release of this award-winning 35mm film, having unfortunately passed away into the next life - as Romani folki believe - two years previously. Teleri and Nia, her two daughters, are certain their mother would have been "proud" of the outcome and more prouder for Romani culture that the Welsh language broadcaster S4C, noted for their world-spanning animations, had the vision to commission such a piece of filmic brilliance fit for world cinema. Hundreds of schoolchildren auditioned for the children’s roles. Iona Wyn Jones from Bethesda was picked to play the lead role of Eldra, with Gareth Wyn Roberts playing Robat. The film's producer was Bethan Eames, with sister Manon Eames writing the script. It was directed by Tim Lyn, "The film is not about anti-Romani prejudice, nor ... a picturesque romantic expression of the Romani way of life. The subject and drama is: what happens when different worlds begin to meet, sometimes even clash and collide". * 24th Celtic Film & Television Festival - Jury Award. 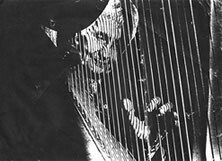 Robin Huw Bowen composed the score and plays the triple harp on Eldra. Robin is an acknowledged musical authority, specializing in Welsh folk and Gypsy music, and he performs Welsh harp music around the world. In 1998 he joined with three other traditional Welsh musicians to form Crasdant. 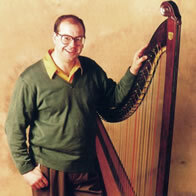 Recently, he has formed a Welsh triple harp choir called Rhes Ganol with four other triple harpists. Why is Eldra the Drama so important? - it's extremely significant for both Welsh Romani culture and Welsh culture and a landmark film for the nation. When I first saw Eldra I was instantly captured by the quality of the cinematography. It has to be said Teliesyn's film production team and the array of talented Welsh actors did a smart job making this 35mm film. It's what Welsh film-making is all about - embracing the cultural traditions and projecting their richness into the world arena. With Eldra nothing is watered down for some short-lived market. It's a earthy period drama - that locks out the present day for 90 minutes - then the nostalgic flicker disappears into the ethos of past history. A social drama that will one day etch its name in the film vaults as a Welsh classic, alongside the other great Welsh drama Hedd Wyn. The Irish did it with David Lean's Ryan's Daughter, the English with Ken Loach's Kes, and let's not forget the smoky top brilliance of A Taste of Honey, a film that went on to inspire the creation of Coronation Street, which then iconically inspired the whole development of the Soap World as we know it today. Without question, an evolution on celluloid. What's after Eldra? of course Wales needs to move on with contemporary film concepts, but lets not forget to make the "The Obvious" at some point. When will Llewelyn the Last or Prince Madog and the Discovery of America ever hit the silver screens or will it just become Llewelyn the forgotten. Away from epics perhaps a simpler challenge - a film of Edgar Christian's adventure , a movie long over due. Film budgets are always a major restricting factor on what can and can't be made, and this certainly applies to S4C with their ever-shrinking kitty courtesy of the powers to be. Yet against all odds every now and then S4C churn out some class stuff, like world spanning animations and Hedd Wyn - robbed of its rightful oscar by an egoistic hollywood. Still, perhaps it's now time Cymru cast off the foggy old cataract and showed clearer vision. We need to embrace new methods in how to successfully nurture our vast secret vaults of ancient literature and adapt these past works of arts into formats for the future world arena - so people can learn what Celtic Wales is about, that we're not just a rock garden full of sheep, and most importantly where we are located. How many Americans still think Wales is in England! As one well-travelled old mush from Chile once told me: "I've travelled in my lifetime around every crease of the world but Wales is my favourite secret corner "
The Real Eldra Roberts - Descendant of Abram Wood, the first Romani to settle in Wales "I'm not going to be on celluloid when I'm gone." Eldra was born in 1917, and her father taught her to play the Welsh harp. She soon followed in her ancestral tradition by taking up the Romani way of the harp and learning her forefathers' Gypsy music. It wasn't long before she became a well known player. Eldra joined the land army in the Second World War and was deployed as a rat catcher on Anglesey - she had a way with nature. She was spotted dancing barefoot in the snow outside Bangor University by a student who was immediately obsessed by her unusual wildness. He later married her, and it truly was the story of the "Gypsy Girl and the Professor" who often had to reign her in due to her Gypsy wild ways and independence. They had two equally independent daughters, Teleri and Nia, both proud of their Romani roots. Knowing about lifes cruel struggles Eldra wanted the best for her chavies and brought them up to respect the Romano and the Gaje way of life, however Teleri was too much like her mother and the wild Gypsy - kalo ratti burned in her veins and still does to this day. Nia contains it better. As old age crept up on their mother, Eldra secretly kept an eye out for a special musician to whom she could entrust the Gypsy harp music of all her ancestors and teach him the exact way it should be played. One day from the sparkles of the local TV studios came the renowned triple harpist Robin Huw Bowen, completely unaware that he was about to be the chosen one. A rapport developed, but not before a cautious period went by, as Robin had to prove himself genuine and worthy of her trust. Eldra displayed her typical Gypsy wily ways but it was short-lived, and Robin would go round to her house so she could pass down the music, all played by ear, to perfection. If not, Robin had to start again till it was right. "Once you've learnt the pieces, only then can you add your own styles to them as you wish". A few years before her death, Eldra was interviewed by producer Bethan Eames - these stories later became the basis for the television drama Eldra scripted by Bethan's sister Manon Eames. Her own composition, Eldra's Polka, features throughout the soundtrack of the film. Teleri, Eldra's daughter, told me: "My mother went through a period of not wanting to be interviewed on TV. She said: "I'm not going to be on celluloid when I'm gone". How ironic that she's now on an award-winning 35mm film. "The idea for a film sat on the shelves of the TV company for some years, and it's sad that my mother died before the film was made - she never saw it," said Teleri. Her sister Nia continued: "She would have been very pleased that it was finally made. However, she would have been critical if she spotted anything not quite right and would have said so regardless of who heard" - Eldra's spirit lives on, and she would be pleased that her Romani heritage was getting the celluloid recognition it deserves. 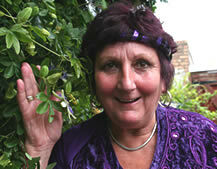 Read more about - The integration of Welsh Gypsies Buy Eldra DVD!